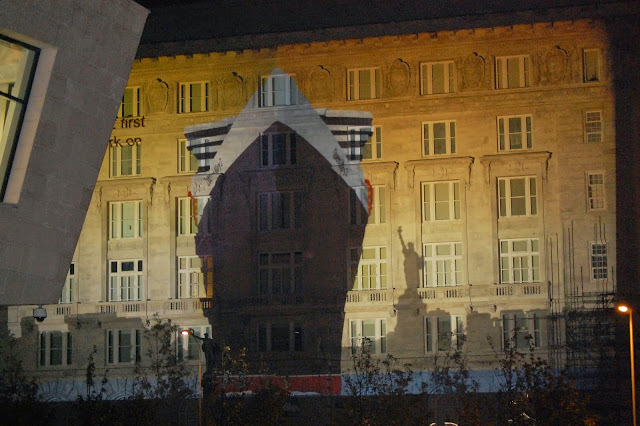 QM2 arrives at 9.00am and berths at the Liverpool Cruise Terminal, 10.00pm, "AMAZING GRACES" projections, 10.30pm fireworks display. QM2 leaves her berth at 10.45am to greet her two fleet mates at Brazil Buoy. 12.00 to 2pm, the three ships sail in formation towards the Liverpool Echo Arena and then north along the Mersey. 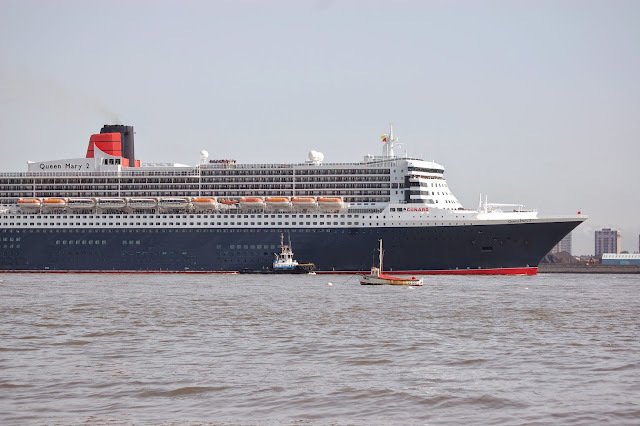 2.10pm, QM2 leaves the city, QUEEN ELIZABETH berths at the Cruise Terminal and QUEEN VICTORIA anchor's on the Mersey. 10.30pm, Fireworks Display and the QE leaves the city, QV berths at the Cruise Terminal. At just over 151.000 G.T., QM2 is the largest Transatlantic Liner ever built, she was introduced in 2004, today she is the only liner offering a regular transatlantic service between Europe and North America, she will be visiting again Liverpool this May, she is in my opinion the most spectacular passenger ship in service. Photos above taken during two of her previous calls at Liverpool in 2011 and 2009. 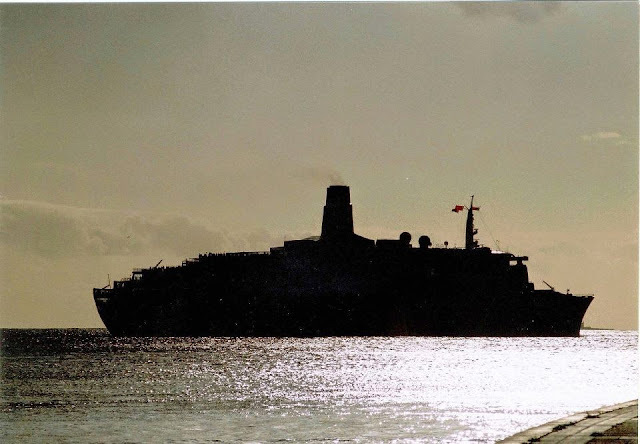 QE2 remembered this May 2015, the year CUNARD celebrates 175 years of their History, the iconic ship sailed from 1969 to 2008 for the CUNARD LINE and will always be one of the most remarkable ships to have sailed the Oceans of the World, as a liner and as a cruise ship, the QE2 remains at Dubai awaiting a decision regarding her future. 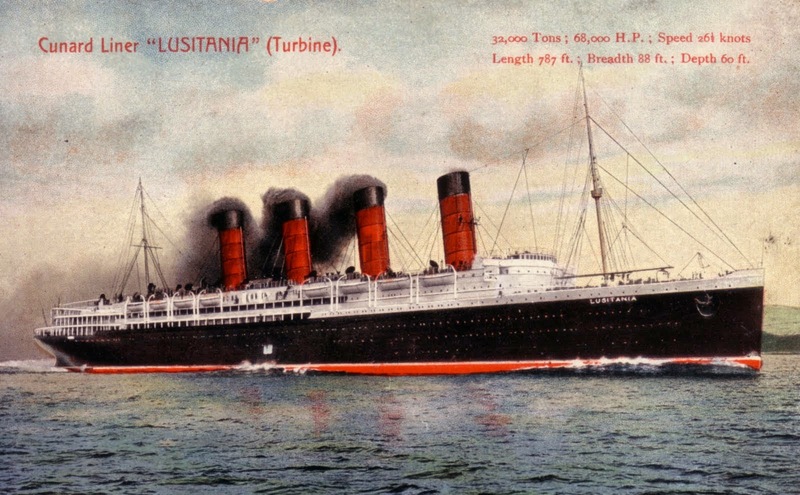 LUSITANIA is one of the most talked about CUNARD passenger ships, for the good, the bad and the reasons we will never know, my thoughts are today with the families affected by the sinking of the ship exactly one hundred years ago, after been torpedoed by a German submarine. Cobh and Liverpool remembered the people that died on that terrible day. LUSITANIA was for a brief period of time the largest passenger ship in the World at 31.550 G.T., she was built by the prestigious JOHN BROWN shipyards and launched in 1907, one of the sleekest and most remarkable liners ever to have sailed lies at the bottom of the sea with so many untold stories and surely keeper of so many secrets. 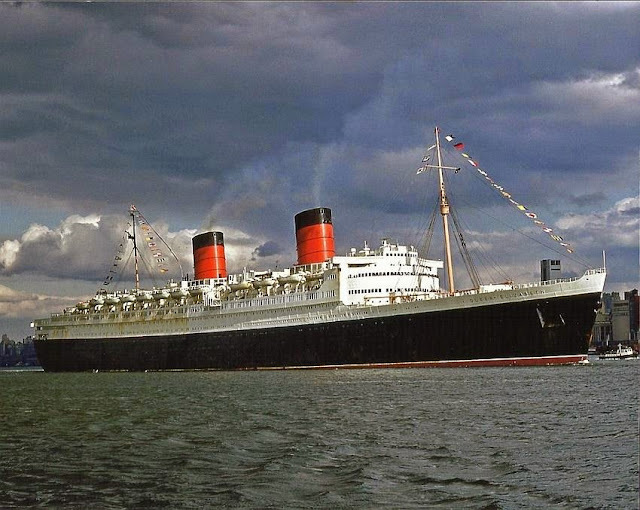 Tomorrow, 7.5.2015 marks 100 years of the sinking of the LUSITANIA, tomorrow another "post" about this delightful ship, one of the most famous Cunarders. 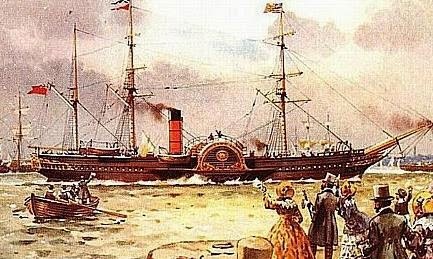 The driving force of the CUNARD LINE when first established was the mail contract, the emphasis quickly moved to the vast number of emigrants that in the second half of the 19th Century and early years of the 20th departed Europe to North America. 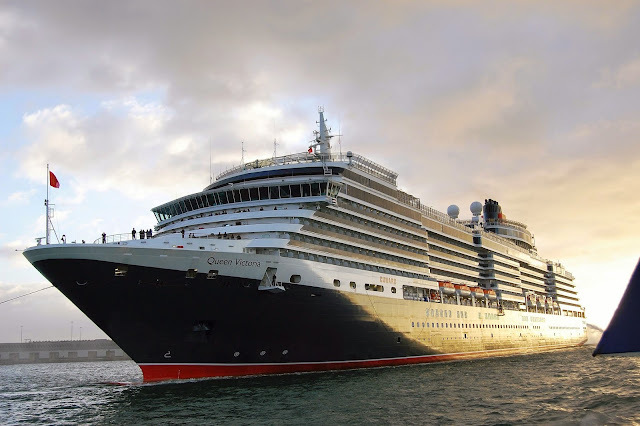 CUNARD has operated many legendary Liners, four of the most prestigious are the QUEEN ELIZABETH, QUEEN MARY, QE2 and QM2. Today with the 2004 built QUEEN MARY 2, CUNARD is still the only shipping company to offer a regular transatlantic service between Europe and North America, with regular departures from Southampton, also recently extended to Hamburg to New York. May 2015 is all about CUNARD LINE here, the prestigious CUNARD celebrates 175 years, founded in 1840 by Samuel Cunard as the BRITISH AND NORTH AMERICAN ROYAL MAIL STEAM PACKET COMPANY, today CUNARD is a subsidiary of CARNIVAL CORPORATION, stay tuned, we will remember and update the Company's History, remember some of their most celebrated and historic passenger ships and of course will also bring photos and current notifications of the May celebrations this year. 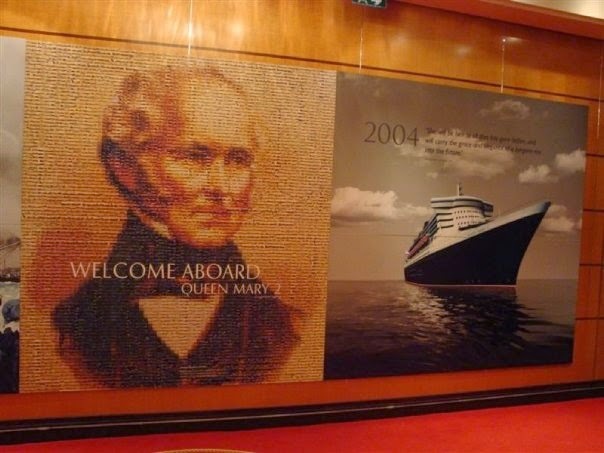 To start celebrating the 175th Anniversary of the CUNARD LINE, the three QUEENS of the fleet, QUEEN MARY 2, QUEEN ELIZABETH and QUEEN VICTORIA will be together at Southampton tomorrow, 3.5.2015, the three ships will sail together in day light for the first time, QM2 will lead the way, followed by Queen Victoria and the Queen Elizabeth, the departure also marks the beginning of the new summer season for the CUNARD LINE, Mary will head for New York, the Victoria to Guernsey and the Elizabeth to Hamburg, the three ships will be once again together and for the very first time at their spiritual home of Liverpool on the 25.5.2015. Photo of the three ships together when they met in Lisbon last year by Luis Miguel Correia, copyright photo.